According to our contacts in Wonderland, the local tea parties are dangerously under-attended. Granted, that often means that there may be only an empty seat or two, but when the Mad Hatter and Dormouse both announce that a very important guest has not yet appeared, we are quick to respond. The last time they came up, it took us weeks to clean up the office… and that time, they only came to borrow some sugar cubes! 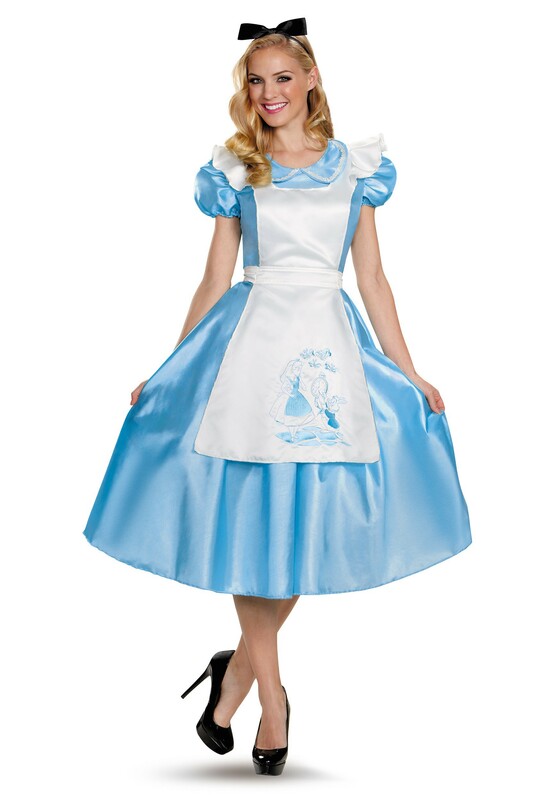 And that is where you come in with this Classic Alice Deluxe Adult costume. You won’t be late for this important date! The iconic blue polyester dress fastens in the back with Velcro and has short puffed sleeves and a princess-cut bodice as well as the innocent-looking white apron… good both for catching tea and showing your more composed side. The black satin ribbon bow is sewn onto a fabric covered headband which gives you the final look of elegance needed to keep up with those queens, should they attend… Join the outfit with an Alice Wig or rabbit fur purse and everyone is sure to recognize you even without a table setting. Treat yourself to a delightful afternoon or evening with the Wonderland Court and be on your way to even earning yourself the crown at the end of the chessboard!